Following on from adding specimens to my OpenURL resolver, I've added support for GenBank records. Either an OpenURL request such as http://bioguid.info/openurl?id=genbank:DQ502033, or the short URL http://bioguid.info/genbank/DQ502033 will resolve the GenBank record for accession number DQ502033. The HTML isn't much to look at, the real goodness is the JSON (obtained by appending "&display=json" to the OpenURL request, or ".json" to the short form, e.g. http://bioguid.info/genbank/DQ502033.json). The resolver gets the sequence form NCBI, does a little post processing, then displays the result. Postprocesisng includes parsing the latitude and longitude coordinates (something of a mess in GenBank, see my earlier metacrap rant), extracting specimen codes, adding bibliographic GUIDs (such as DOIs, Handles, or URLs), finding uBio namebankID's for hosts, etc. Note that some records have a key called "taxonomic_group". This is to provide clues for resolving museum specimens -- often the DiGIR provider needs to know what kind of taxon you are searching for. The aim is to have a simple service that returns somewhat cleaned up GenBank records that I (and others) can play with. The A Shared Culture video from the Creative Commons web site. Thinking more and more about using Mediawiki (or, more precisely, Semantic Mediawiki) as a platform for storing and querying information, rather than write my own tools completely from scratch. This means I need ways of modelling some relationships between identifiers and objects. 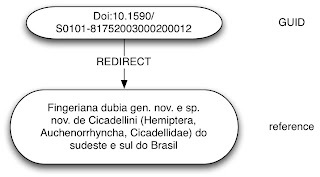 The first is the relationship between document identifiers such as DOIs and metadata about the document itself. One approach which seems natural is to create a wiki page for the identifier, and have that page consist of a #REDIRECT statement which redirects the user to the wiki page on the actual article. It is trivial to have multiple GUIDs linking to the same paper (e.g., PubMed identifiers, Handles, etc.). In this example, there are two taxon names Pinnotheres, so the user would be able to choose between them. The advantage of this is that if we subsequently discover a homonym we can easily handle it by changing the REDIRECT page to a disambiguation page. In the meantime, users can simply use the name string because they will be automatically redirected to the taxon name page (which will have the actual information about the name, for example, where it was published). Of course, we could do all of this in custom software, but the more I look at it the power to edit the relationships between objects, as well as the metadata, and also make inferences makes Semantic Mediawiki look very attractive. Following on from the previous post, I wrote a simpe Mediawiki extension to insert a Google Book into a wiki page. Written in a few minutes, not tested much, etc. To use this, copy the code below and save in a file googlebook.php in the extensions directory of your Mediawiki installation. The id gives the book identifier (such as an OCLC number or a ISBN (you need to include the identifier prefix). By defaulot, the book will appear in a box 425 × 400 pixels in size. You can add optional width and height parameters to adjust this. I stumbled across this book whilst searching for the original record for the snake Enhydris punctata. Confusingly, the Catalogue of Life lists this snake as Enhydris punctata GRAY 1849, implying that Gray's original name still stands, whereas in fact it should be Enhydris punctata (Gray, 1849) as the Gray's original name for the snake was Phytolopsis punctata. It's little things like this that drive me nuts, especially as the Catalogue of Life has no obvious, quick means of fixing this (Wiki, anyone?). I was also interested in using the OCLC numbers a GUID for the book, but there are several to choose from (including two related to the Google Book). Unlike DOIs, a book may have multiple OCLCs (sigh). Still, it's a GUID, and it's resolvable, so it's a start. Hence, one could link GUIDs for the names published in this book to the book itself. As part of the slow rebuild of bioguid.info, and as part of the Challenge, I've started making an OpenURL resolver for specimens. Partly this is just a wrapper around DiGIR providers, but it's also a response to the lack of GUIDs for specimens. In the same way that I think OpenURL for papers only really makes sense in a world without GUIDs for literature (DOIs pretty much take care of that), given the lack of specimen GUIDs we are left to resolve specimens based on metadata. 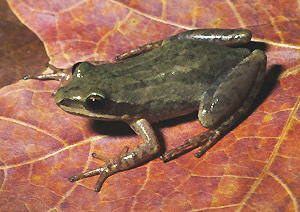 For example, the holotype of Pseudacris fouquettei (shown in photo by Suzanne L. Collins, original here) is TNHC 63583. In a digital world, I want the paper describing this taxon, and the specimen(s) assigned to it to be a click away. In this spirit, here is an OpenURL link for the specimen: http://bioguid.info/openurl/?genre=specimen &institutionCode=TNHC &collectionCode=Herps &catalogNumber=63583. Click on this link and you get a page with some very basic information on the specimen. If you want more, append "&display=json" to the URL to get a JSON response. So, armed with this, TNHC 63583 becomes resolvable, and joining the pieces becomes a little easier. Mike Sanderson's wall of monitors is getting some attention. Cool as it looks (and I'm positively green with envy), this strikes me as the LCD equivalent of Science's suggestion that the reader print out a tree on several bits of paper doi:10.1126/science.300.5626.169. If we can fit the planet on a monitor, can't we fit the tree of life? 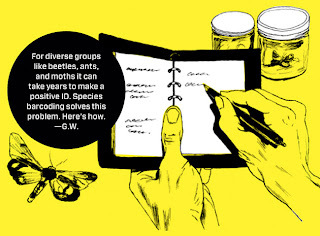 The latest issue of Wired has an article on DNA barcoding, entitled "A Simple Plan to ID Every Creature on Earth". The article doesn't say much that will be new to biologists, but it's a nice intro to the topic, and some of the personalities involved. The rather frail nature of biodiversity services (some of the major players have had service breaks in the last few weeks) has prompted me to revisit Dave Vieglais's BigDig and extend it to other services, such as uBio, EOL, and TreeBASE, as well as DSpace repositories and tools such as Connotea. The result is at http://bioguid.info/status/. The idea is to poll each service once an hour to see if it is online. Eventually I hope to draw some graphs for each service, to get some idea of how reliable it is. Much of my own work depends on using web sites and services, and I'm constantly frustrated when they go offline (some times for months at a time). My aim is to be constructive. I well aware that reliability is not easy, and some tools that I've developed myself have disappeared. 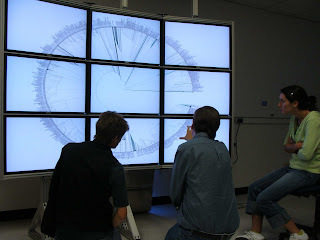 But I think as a community we need to do a lot better if biodiversity informatics is to deliver on its promise. The list of service is biased by what I use. I'm also aware that some of the DiGIR provider information is out of date (I basically lifted the list from the BigDig, I'll try and edit this as time allows). Comments (and requests for adding services) are welcome. There is a comment box at the bottom of the web page, which uses Disqus, a very cool comment system that enables you to keep track of your comments across multiple sites. It also supports OpenID. As I've noted elsewhere on this blog, and as demonstrated by Yesson et al. 's paper on legume records in GBIF (doi:10.1371/journal.pone.0001124) (not cited by Robertson), there are major problems with geographical information in public databases. I suspect there will be more papers like this, which I hope will inspire database providers and aggregators to take the issue seriously. (Thanks to David Patterson for spotting this paper).